The Intel Xeon E5-2620V3 Processor from HP supports Intel Turbo Boost 2.0 technology. With this, the processor can achieve maximum speed of up to 3.2 GHz. The E5-2620V3 features 6 cores with 12 threads in a FCLGA2011-3 socket. 6 cores allow the processor to run multiple programs at the same time without slowing down the system. 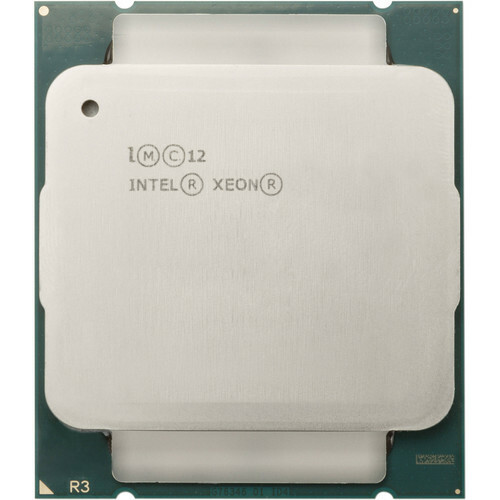 In addition, this Xeon processor supports DDR4 memory for improving the performance of memory-intensive workloads. ECC Memory Support indicates processor support for Error-Correcting Code memory. ECC memory is a type of system memory that can detect and correct common kinds of internal data corruption. Intel vPro technology is a set of security and manageability capabilities built into the processor aimed at addressing four critical areas of IT security; threat management, including protection from rootkits, viruses, and malware, identity and web site access point protection, confidential personal and business data protection, and remote and local monitoring, remediation, and repair of PCs and workstations. Intel Virtualization technology allows one hardware platform to function as multiple virtual platforms. It offers improved manageability by limiting downtime and maintaining productivity by isolating computing activities into separate partitions. Intel Virtualization technology for Directed I/O (VT-d) continues from the existing support for IA-32 (VT-x) and Itanium processor (VT-i) virtualization, adding new support for I/O-device virtualization. Intel VT-d can help end users improve security and reliability of the systems and also improve performance of I/O devices in virtualized environments. Intel 64 architecture delivers 64-bit computing on server, workstation, desktop and mobile platforms when combined with supporting software. Intel 64 architecture improves performance by allowing systems to address more than 4GB of both virtual and physical memory. Intel Demand Based Switching is a power-management technology in which the applied voltage and clock speed of a microprocessor are kept at the minimum necessary levels until more processing power is required. Intel AES New Instructions (Intel AES-NI) are a set of instructions that enable fast and secure data encryption and decryption. AES-NI are valuable for a wide range of cryptographic applications, for example applications that perform bulk encryption/decryption, authentication, random number generation, and authenticated encryption. OS Guard improves security by strengthening malware protection, and provides hardware-based protection for your server operating system.